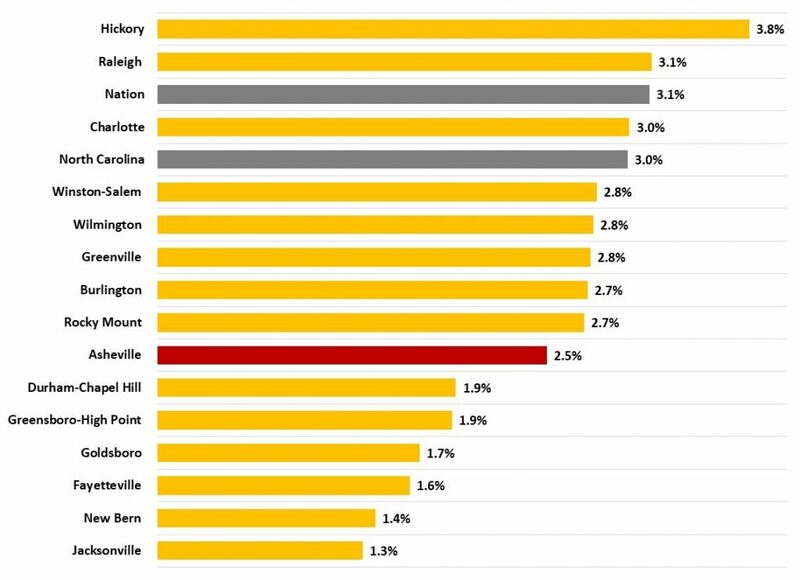 The four-county Asheville metro (Buncombe, Haywood, Henderson, and Madison) is currently into its eighth consecutive year of employment growth. While strong employment growth is an outstanding achievement, a closely-related concern is whether wages are also increasing. Measuring wage growth can be a bit tricky at the local level. Federal agencies regularly publish national and state-level hourly wage averages. Unfortunately, there is no similar program that tracks hourly wages at the metro or county-level. Instead, Federal and state agencies publish average weekly wages at local levels. Average weekly wages are simply total wages in a week’s time divided by the average number of employees over the same time period. In most cases, this method works well, but likely understates average wages in industries with many part-time workers and high turnover rates; which is typical in the hospitality sector. So, Asheville metro’s average weekly wage is probably somewhat understated when compared to areas without similarly large hospitality sectors. Over the last five years, the average annual increase in Asheville metro’s average weekly wage is 2.5 percent. This places the metro ninth among the state’s fifteen metros and below both the national and statewide pace (see chart below). 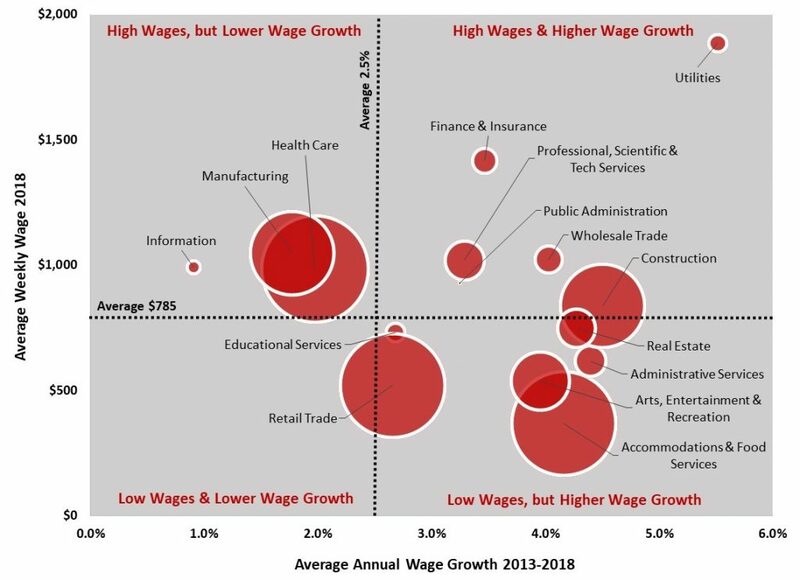 A closer look into Asheville metro’s major industry sectors provides a more complete picture of where wage gains are coming from. Interestingly, the largest percentage wage increases have been coming from Asheville metro’s lower-wage industries (see chart below). For example, while Accommodations & Food Services is Asheville metro’s lowest wage industry sector (average weekly wage of $368) its wages have been growing at an average annual pace of 4.2 percent over the last five years. On the other hand, Asheville metro’s Manufacturing sector is among the area’s higher wage industries (average weekly wage of $1,047) and has had an average annual wage growth rate of only 1.8 percent. Bubble size represents the number of added jobs from 2013 to 2018. What might be driving the differing wage gains among Asheville metro’s industries? In this current period of historically low unemployment, attracting and retaining new workers can be especially challenging for employers. Particularly if those employers must continually resupply existing workers with new hires. For each industry’s total workforce, there are wide differences in how many are new hires (see chart below). For example, on average 41 percent of workers in the Accommodations & Food Services industry are new hires, while only 7.9 percent of Manufacturing workers are new hires. This means that employers in the Accommodations & Food Services industry must not only seek new workers to respond to growth demands, but also to replace workers who leave their jobs. Of course, one sure way for industries to increase their pool of likely workers is to raise wages. As the chart illustrates, those industries with the highest share of new hires also tend to be those with the highest rates of wage growth. So, the differences in industry wage growth might partially be explained as a response to the tight labor market. This is especially challenging for low wage industries needing to continuously replace existing workers. *New Hires represent workers newly hired within a 3-month period. So, are wages growing in Asheville? Yes, as measured by average weekly wages, Asheville wages have been growing by an average annual rate of 2.5 percent over the last five years. 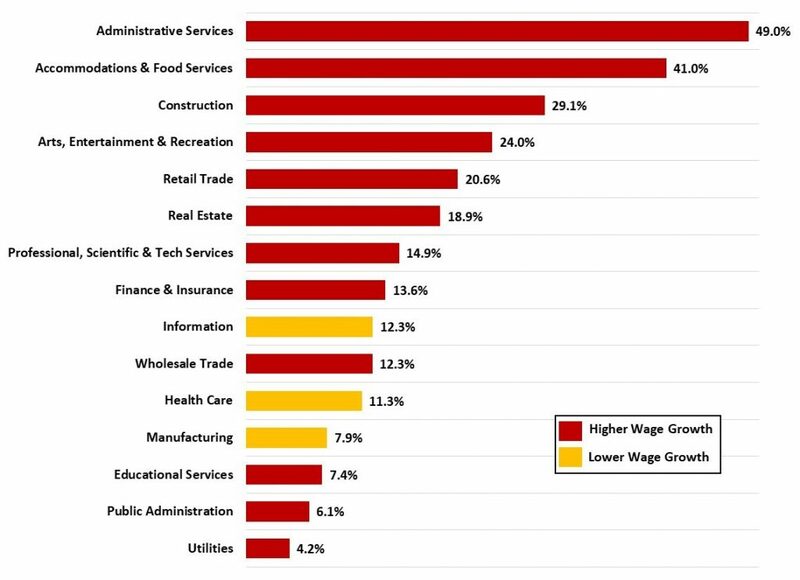 But a closer look at individual industries shows that higher wage growth has mainly been from low wage industries. One way to explain this difference is that when unemployment is low, low-wage industries which are burdened with high worker turnover must raise wages more rapidly to compete for new workers.